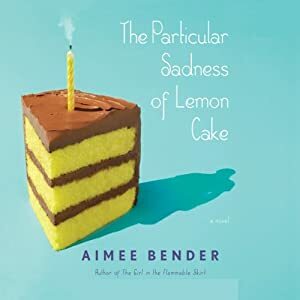 The Particular Sadness of Lemon Cake was the first book I'd read by Aimee Bender, best known for her novel The Girl in the Flammable Skirt. This new novel is muted in tone, especially in the author's performance of her own book on the unabridged audiobook. The narrator is Rose Edelstein, who lives with her family near Hollywood, California. The story starts when Rose is 9 years old, when she finds that she can taste her mother's despair in the cake she cooked. When it happens, she is overcome with emotion, and wants her mouth removed. Slowly she comes to terms with her supernatural ability. Her family life is apparently good on the surface, but she knows how unhappy they are. When, in her teenage years, she realizes that other family members also have remarkable abilities, this brings her no joy. This is no comic book story of superheroes, nor a horror story. It isn't even magical realism. The somber brooding story is about people's secrets and isolation in an everyday context, the emptiness of the modern family, and the possibility of achieving connection with family anyway. It strangely lacks drama, yet I kept on listening to the audiobook, because it was unusual and it drew me in, since I wanted to know how Bender would continue the story. Although enough happens to keep the plot going, there's hardly any suspense and the book feels emotionally flat. Yet it is pleasing and memorable -- because the themes of food, family and emotions are powerful, and the descriptions of Rose's eating and tasting are wonderfully sensual.